PINE VALLEY – Aircraft dropping retardant on a fire two miles southwest of the Pine Valley community were grounded Monday afternoon due to a “near-miss” with a drone. 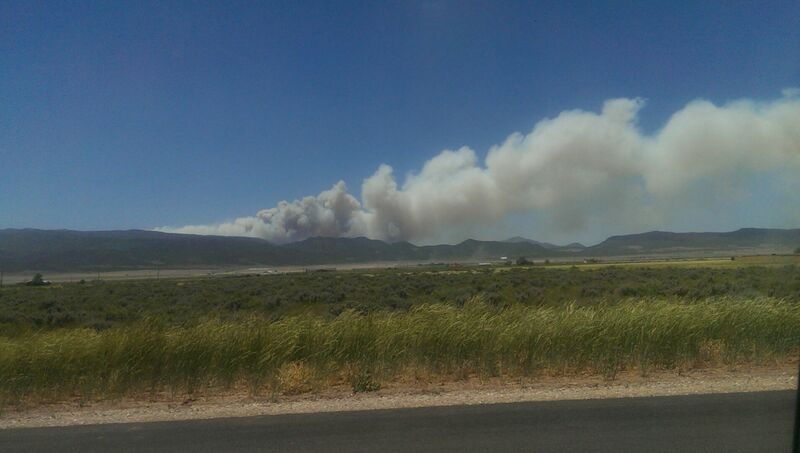 It is the third incident involving a drone impeding fire suppression efforts in southwest Utah. 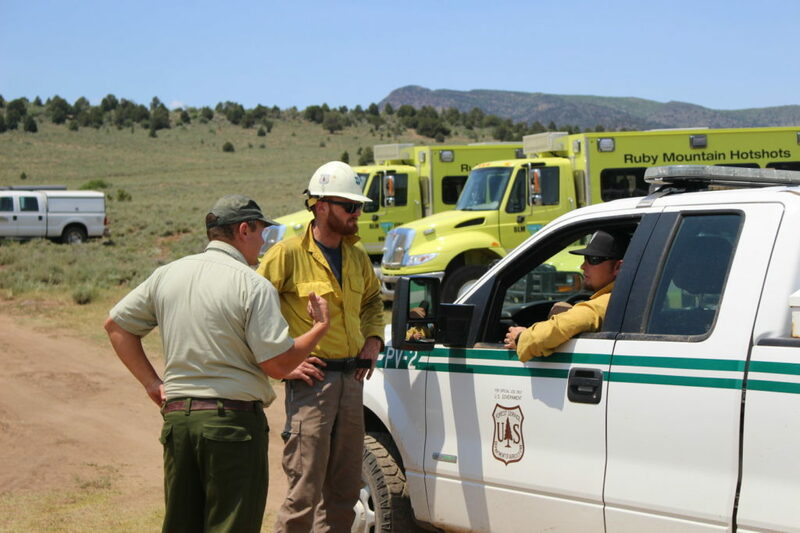 The third incident took place near the Saddle Fire around 3 p.m. when a drone was sighted in the area of Baker Reservoir by the crew of a firefighting helicopter, Christian Venhuizen, of the Bureau of Land Management’s Color County District, said. The Washington County Sheriff’s Office was called to investigate the incident, yet were unable to locate the party operating the drone. 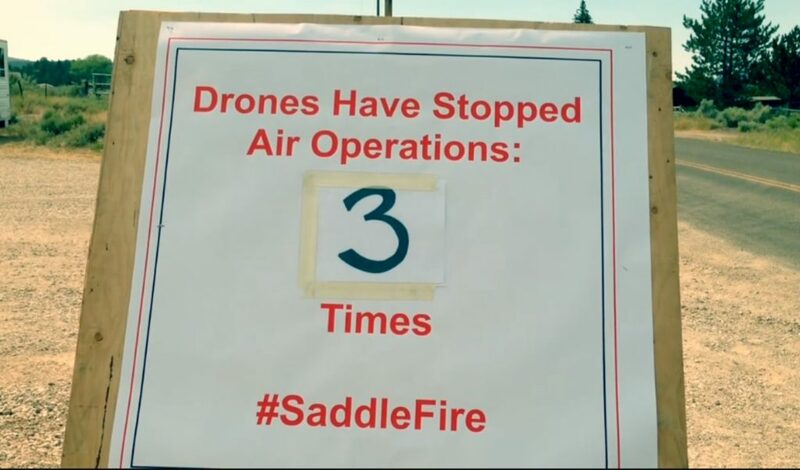 According to Utah Fire Info, air operations over the Saddle Fire will be grounded until the drone problem is resolved. The first drone sighting occurred Sunday morning in the area of the Aspen and Pine Canyon fires. 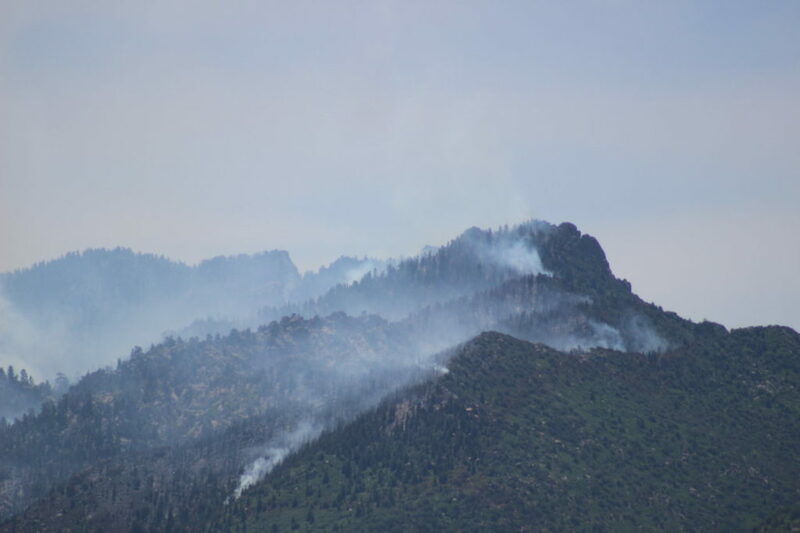 The second sighting near the Saddle Fire occurred Sunday evening. 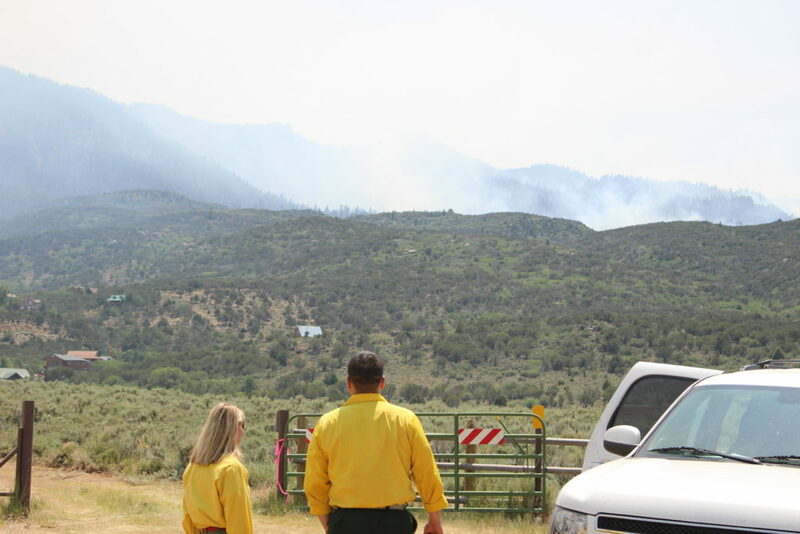 “If they fly, we can’t,” Kim Osborn, BLM spokeswoman for the Aspen and Pine Canyon fires, said Monday. Under Utah law, drone operators face potential misdemeanor and felony-level penalties depending on the level of mayhem their drone may cause in a wildland fire zone. 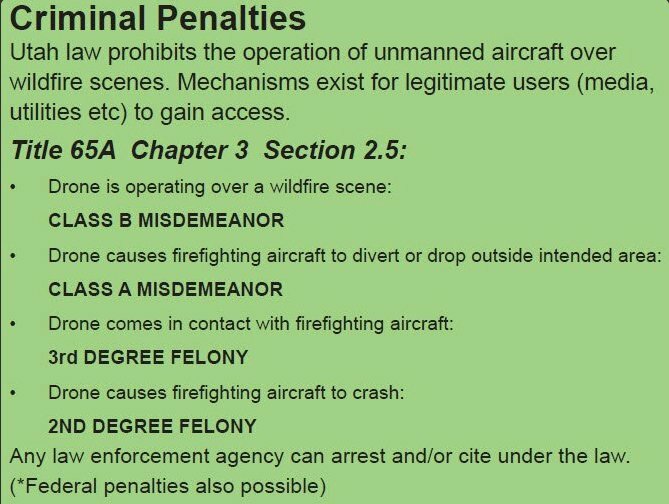 Operating the drone in a wildfire area can result in a class B misdemeanor. If the drone flies into an aircraft and causes it to crash, that’s a second-degree felony. On the federal level, fines can range from $1,000 up to $25,000. “If (a drone) collides with any of our aircraft, it’ll cause an accident,” Osborn said. Chris Henrie, Incident Commander over the Saddle Fire, said Sunday evening’s drone sighting came at a crucial moment when aircraft were trying to drop retardant on fire. Instead of being allowed to do the job, the aircraft had to turn back. The latest drone incident involving a helicopter was a “near-miss,” according to fire officials. Local residents received notifications on their mobile phones regarding the drone pilot and the suspension of aerial resources responding to the fire. A door-to-door campaign is also planned by the incident management team. Those with information regarding drones flying in the area of the Saddle Fire should contact the Washington County Sheriff’s Office at 435-634-5734. There is a 5-mile Temporary Flight Restriction zone around the Saddle Fire, as well as a 7-mile zone around the Aspen Fire. As of Monday afternoon, the Saddle Fire has grown to over 350 acres and continues to burn in inaccessible terrain. So far the fire is zero percent contained. “The fires are up in extreme terrain where we can’t get firefighters in there safely,” Henrie said. 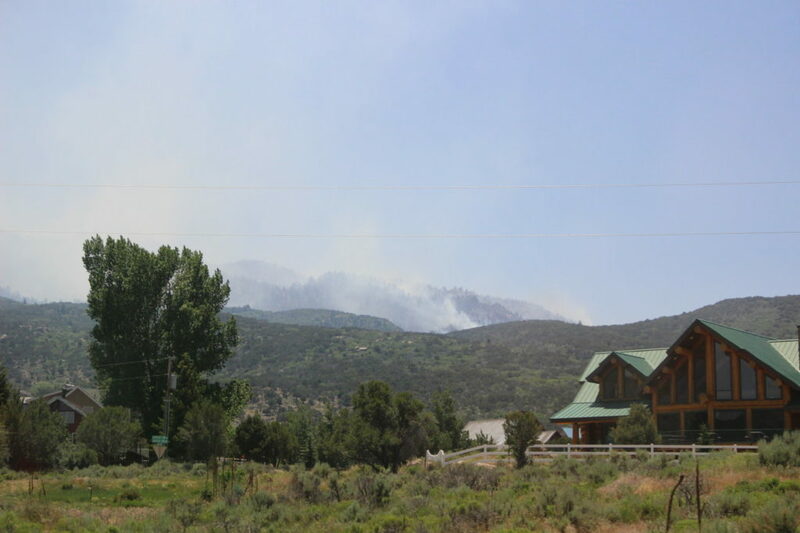 The fire itself is located about 2 to 2 1/2 miles southwest of the community of Pine Valley. No structures are currently threatened, though measures are being taken to protect homes in the area in case the fire gets too close. 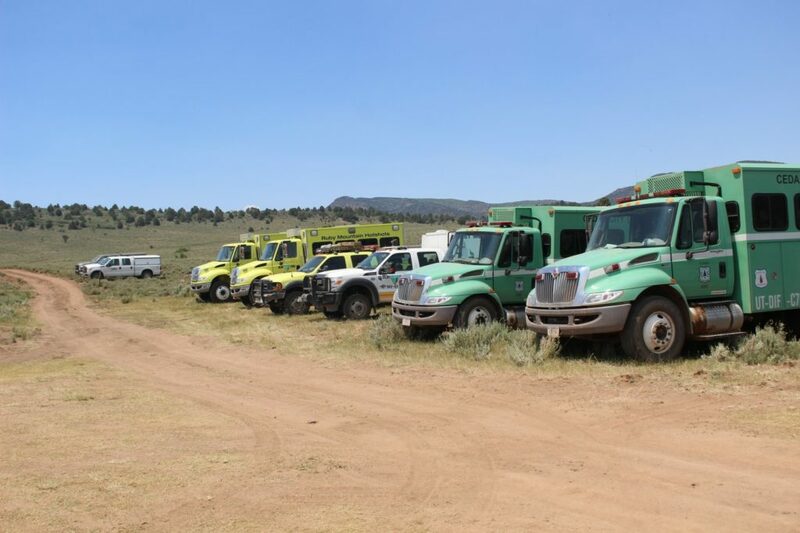 Fire fuels is the area are being reduced and defensible spaces are being created. 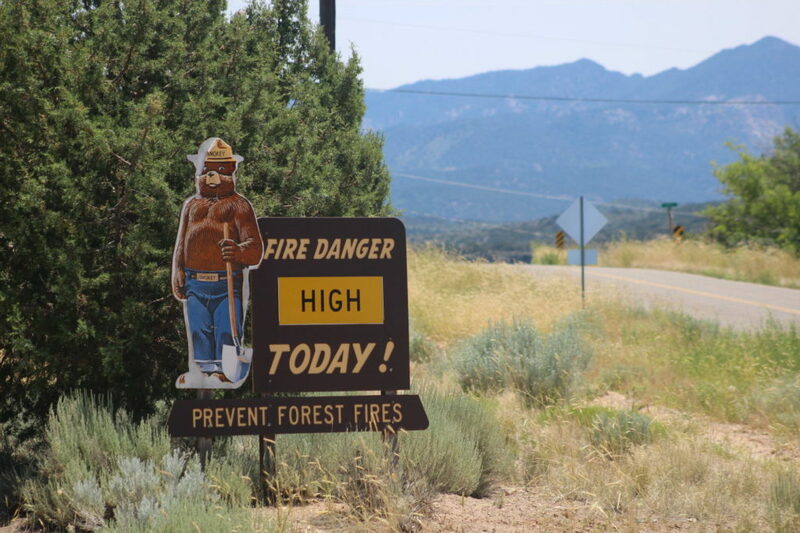 A fire break has been created only along the boundaries of private property and land overseen by the U.S. Forest Service. Incident Commander trainee Joe Harris pointed to a narrow, 2-foot wide strip of ground that had been cleared to the soil. Trees and other vertical vegetation covering a 10-foot area around the 2-foot soil cut were also cut down so the fire would only have ground-level fuels to consume and hopefully exhaust itself by the time it hit the fire break. A wide, bulldozer cut has also been made as a precautionary measure, Harris said. There’s no way to tell how long it may take for the fire to actually burn down to the fire break, or when it may get to a point firefighters can attack it directly, both Harris and Henrie said. The Saddle Fire was ignited by lightning and discovered June 13. So far the only major impact to the Pine Valley community has been smoke dropping into the area. No evacuations have been ordered and no roads have been closed in connection with the fire. However, the Goat Springs Trail is closed until further notice. The Aspen Fire, also lightning-caused and located 13 miles southwest of Cedar City, is at 355 acres as of Monday afternoon and 85 percent contained, Osborn said. As operations around the Aspen Fire have wound down, fire crews and resources involved there have been diverted to other fires, Osborn said. As of Sunday, around 300 people were involved in fighting the fire. 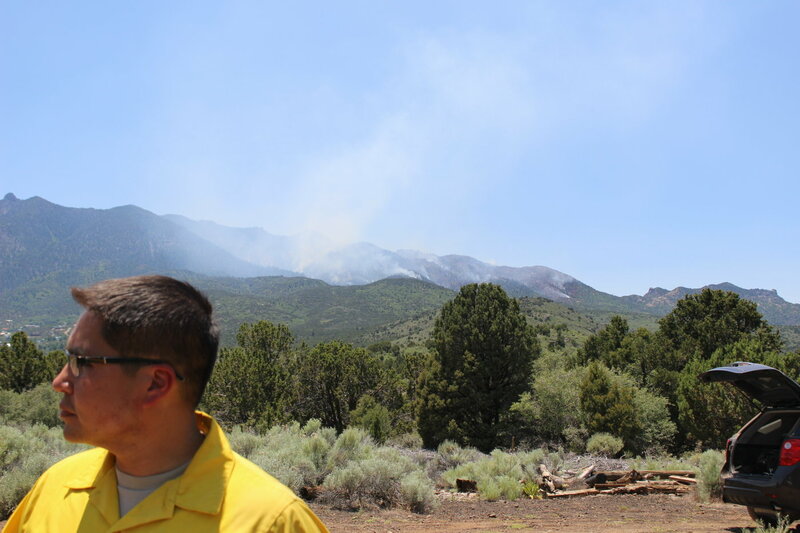 The Aspen Fire was originally reported Wednesday, June 15. 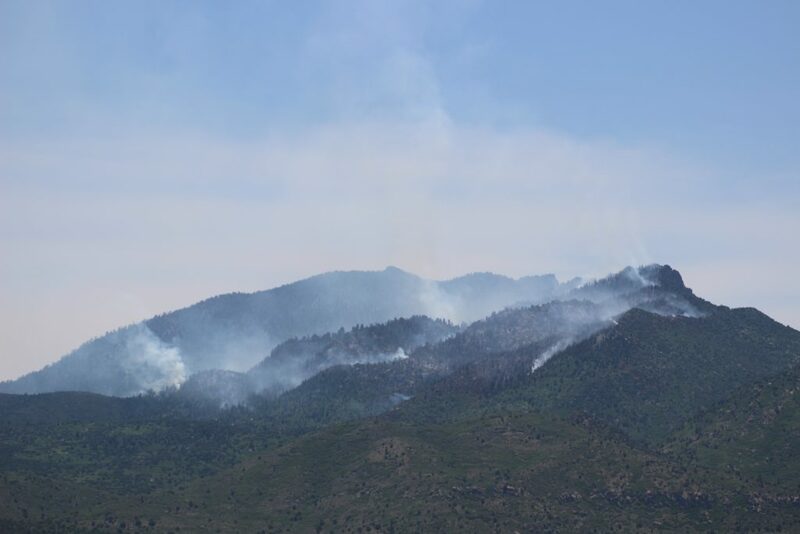 As for the lightning-triggered Pine Canyon Fire, located three miles south of the Aspen Fire, is at 100 percent containment. It was also reported to fire officials June 15. The public can receive alerts for emergencies and other important community messages by signing up for the Citizen Alert System for Iron County and surrounding cities. A fire information center has been established at the fire station in Central. 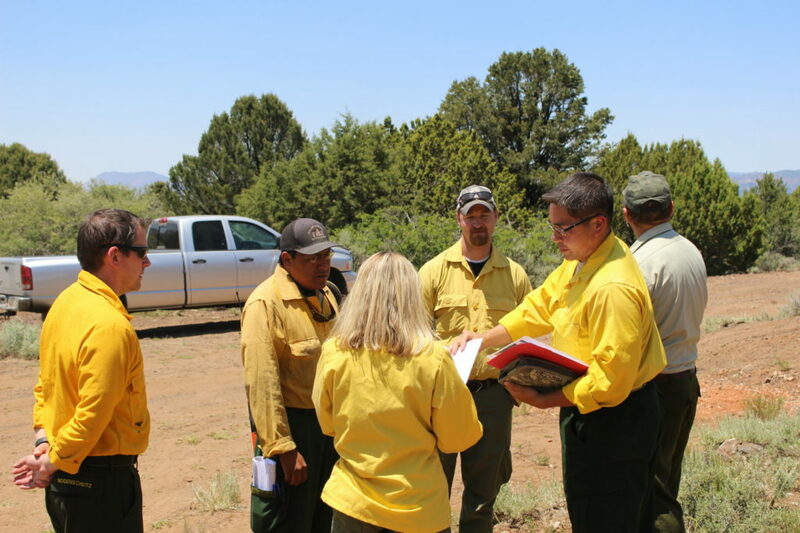 For further information please follow the Dixie National Forest on Facebook, Twitter, and utahfireinfo.gov. Utah law regarding unmanned aircraft, such as drones, can be found here. This is becoming an epidemic and people need to stop flying the drones by the fires. Most likely someone up there Knows who it is as drones are a rather new ‘toy’ . Time to raise some reward money for whomever outs this nut . word is now out and some 1/2 wit is still causing problems . How much of a bounty would it take to ID this perp ? everyone’s so mad. let’s gather the pitchforks and the axes, we’ll find him, and off with his head! Lets be smart about this and rather than cause an accident or allow this issue to continue further lets bring someone in that has a drone that can follow the perpetrator and catch them on video and find out who they are. 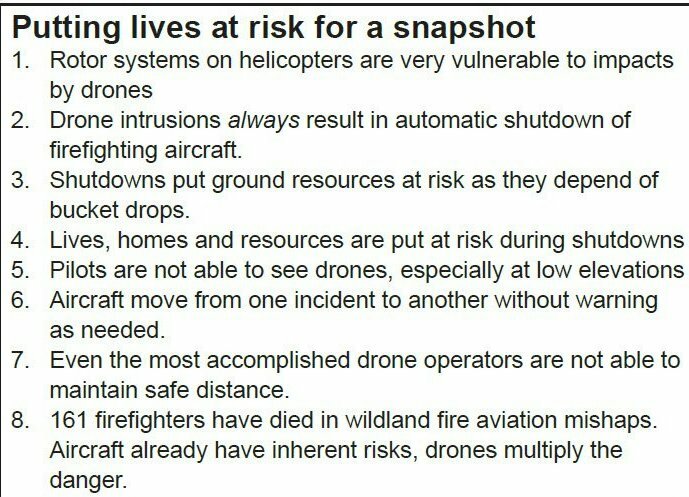 Whoever we bring in could work along side the Forest Service, BLM, and Sheriff’s department and only operate when manned aircraft are not in the air keeping everyone safe. It would be even better if that someone we brought in was commercially legal to fly drones, has years of experience flying them, but also was an actual pilot with experience working with air traffic control, flying in restricted airspace, and flying at low altitude around other aircraft operating in the area. I know a company that meets all that criteria. Why hasn’t anyone called AirVidTech in St George to help? Careful tyler. you just overwhelmed law enforcement LOL !